I'm back with another chatty post today. Since I last did one of these i've finished University (kind of scary!) so i'm now enjoying some well needed rest time before I go to Stockholm a week on Tuesday which i'm very excited about. Having some free time as meant i've been wanting to get lots done. Since we moved house in February i've wanted to paint my room which I finally did last week. I plan on doing a room tour soon since i'm really happy with how it's looking. 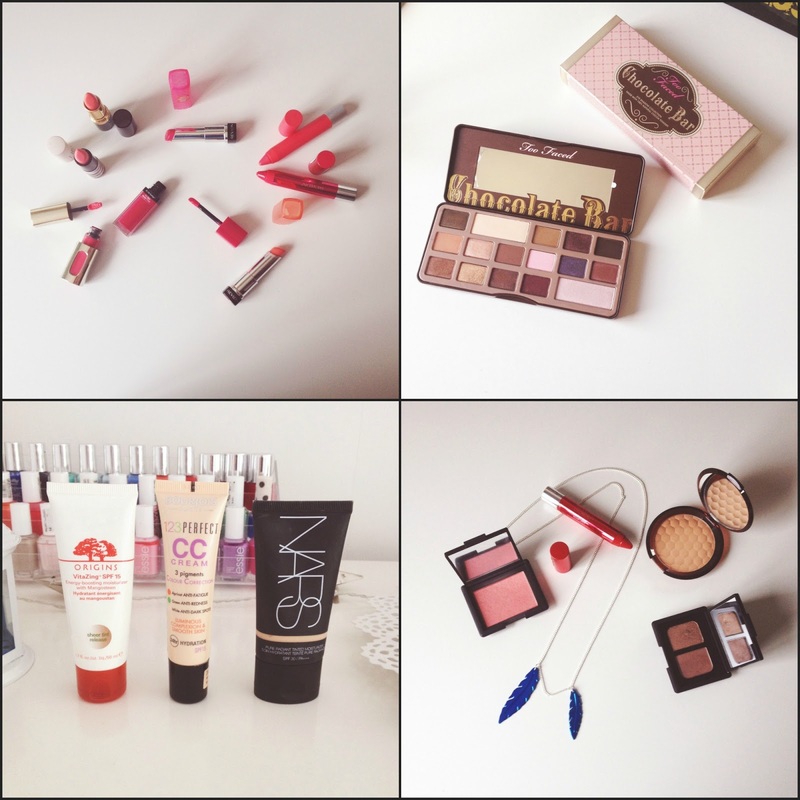 Starting with beauty bits, i've really been enjoying blogging again now I don't have essays to worry about. Some favourite posts recently, Spring Lips, I really love this picture. As well i've been loving Lighter Bases recently; the Bourjois CC Cream as been a true stand out and a great fuss free product to slap on in a rush. A somewhat naughty purchases, I treated myself to the Too Faced Chocolate Bar palette, not only are these shadows beautiful they smell like chocolate. A full blog post on this beauty will be going up soon! I can't help but take pictures of our dog Rufus, I just find him so adorable. The top photo was taken on a Monday morning, I think the head in the paws shows that he wasn't happy for the weekend to be over! As I mentioned i've been decorating my room I also organised my dressing table drawer and things look a lot less messy. I've been back on the healthy eating and fitness again. I've been trying to work out a lot more, to do this i've been going on dog walks with Rufus and doing some of Jillian Michael's workouts. Some are seriously hard work but i'm already feeling stronger. Food wise, I made porridge from scratch the other day which was a really good filling breakfast. As well i've been giving 'healthy' brownies a go. Made with no butter, instead you use on avocado! Still super tasty but more guilt free. 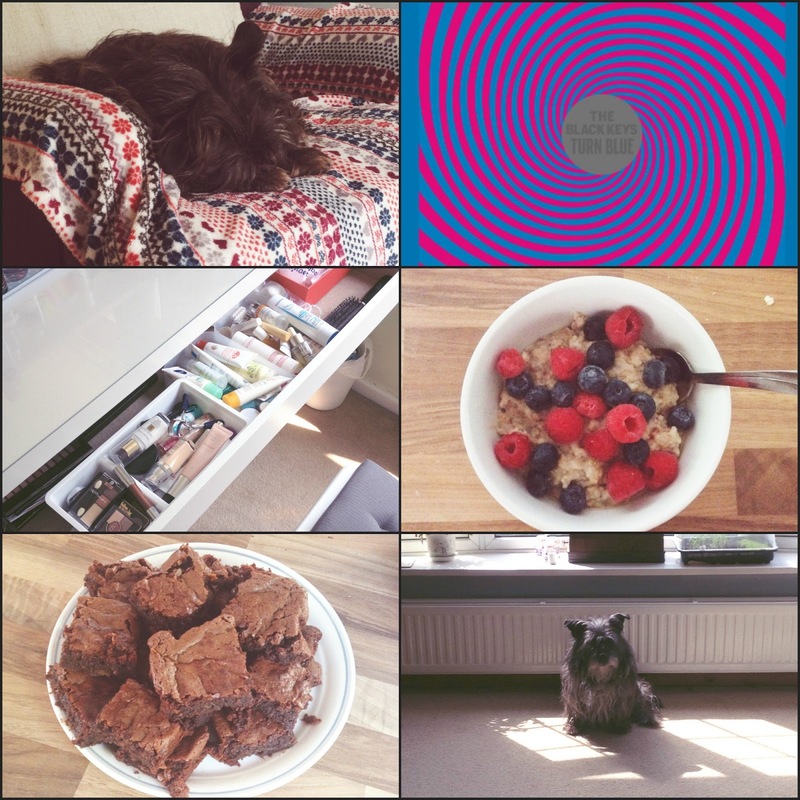 It safe to say the new Black Keys record, Turn Blue has been my main obsession recently. I'm so in love with everything on this album, there's not a track I don't like. The standout for me is the amazing opener Weight Of Love. The lyrics are deep in places yet the music still sounds up beat. TV wise I recently started watching Fringe which is such a weird show yet I find myself kind of addicted. I've also been re-watching True Blood, clearly my upcoming trip to Sweden made me need to watch Alexander Skarsgard as a vampire! So that's what i've been up to recently. I plan on doing some posts on packing and traveling light soon since i've learned some tips which I think will be helpful. What has everyone been up to recently?